Alyssa Marie, owner/artist of Alyssa Marie Gallery, St. Petersburg, Fla., and Braden Everly work this morning on a mural commissioned by Berkshire Hathaway for its new location at 408 S. First St. 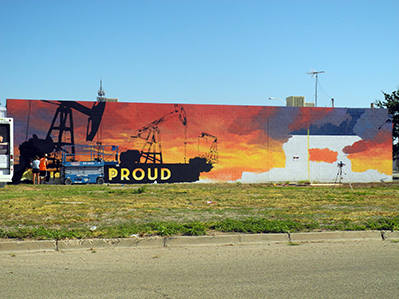 The mural features oil and gas-related scenes on one half, with the currently unfinished second half set to feature a surprise just in time for the start of the Bulldog football team’s 2018 season Friday. “We love working here in Artesia,” the artist said. “Everyone is just so nice.” Marie also created the “Black Betty” and “Alien” murals in Roswell, as well as several throughout Colorado and Florida.